How do I get in direct contact with a specialist at the Clinic Saint-Jean ? The “Health professional” page has been specially created for you. Once you have obtained your access login, you can connect to our private space and view essential information such as the direct telephone numbers for our specialists and our departments. 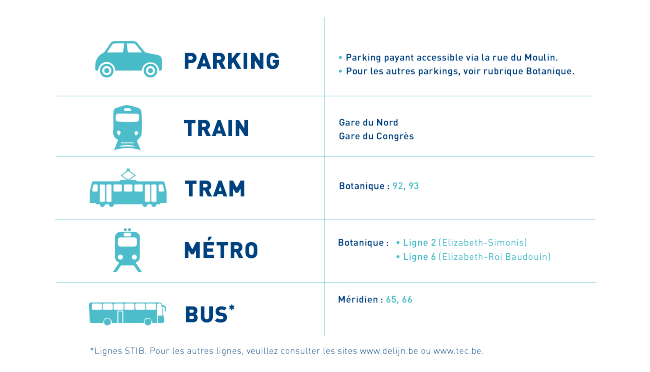 How do I get to Clinic Saint-Jean ? Our 3 locations can be reached by public transport, train or car. Some locations have private parking. 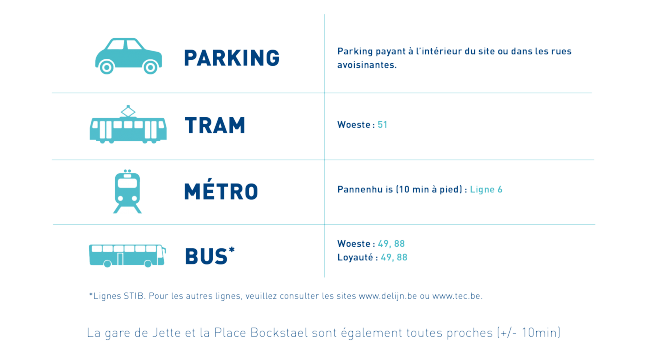 For more detailed information, you can go to our "Access and parking" page. How do I navigate my way through the Clinic? How does your “Route” system work? 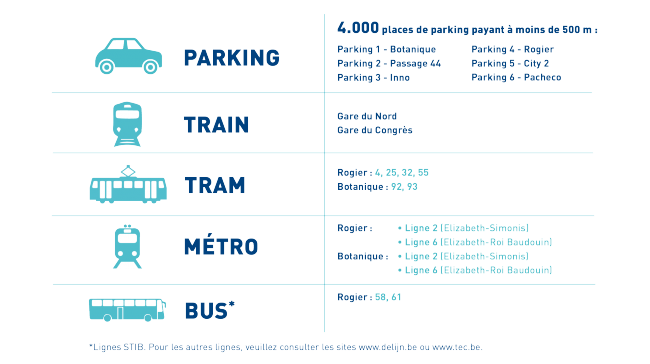 Our Botanique location (including Terranova) is based on a “Route” system, which is not to be confused with bed or room numbers. Each department or care unit has its own route which you must follow. For example, if you have to go to Radiology, you must follow Route 700. All of the Routes are clearly marked on the pages of the various departments or care units. You will also find them on the monitors in the Botanique reception area. You need only know the route number, the floor or the name of the department in order to know where you have to go. At our Léopold I and Méridien locations, the floors where the departments and care units are situated are clearly marked when you enter our buildings. Feel free to ask at the reception desk in any of our locations if you need help. I have a patient’s room number; how do I get to that room ? The Botanique care units and departments have Route numbers or are situated on a specific floor depending on which location you are visiting. You need only to know the route number, the floor or the name of the department in order to know where you have to go. Please note ! The room number is not always linked to the Route number or floor number. Feel free to ask at the reception desk for directions if you have the slightest doubt. What are the Clinic’s visiting hours ? These depend on which location you are visiting and the departments/care units to which you have to go. For further information, go to the “Visiting a patient” page. Kindly respect these hours for the good of our patients. How do I make an appointment to see a specialist ? or by filling in our online form which can be accessed via each department’s page or on the “Making an appointment” page. Someone will contact you at the earliest opportunity to set up an appointment. I am going to be admitted to hospital shortly; what should I take with me ? Items with which to occupy your time: reading material, MP3 player, etc. I have a question about my invoice; whom should I contact ? If you have questions about your invoice, you can visit our “Payment and invoicing information” department. I have an invoice to be paid; how do I proceed ? I have an observation, question or complaint to make regarding my stay or my consultation; whom can I contact? As a patient, you have rights whenever you are treated in a hospital. I you have a question, observation or complaint about these rights, you can contact the Mediation department. Our mediator can be consulted confidentially by telephone, mail, email or during a discussion. I would like to have access to my medical records; what should I do? Through a written request by filling in a specific form. You will find all of the forms to be filled in as well as more detailed information on the “Patient rights and mediation” page. What are the payment methods for consultations ? Most of the departments currently allow payment by Bancontact or cash. Some departments (radiology, ENT, etc.) send an invoice to your home address. Clinic Saint-Jean is aiming to have all consultations made payable by Bancontact in 2016. What is a specialised Clinic ? Clinic Saint-Jean currently comprises a group of 3 specialised clinics: the Cancer Clinic, the Breast Care Clinic and the Obesity Clinic. What is the difference between a contracted physician, a partly contracted physician and a non-contracted/private physician? It is important to know whether your physician is contracted, partly contracted or private as this will affect the amount you will pay for your medical consultation. Representatives from health insurance funds and the medical profession meet to negotiate agreements that set the fees for physicians. Physicians are free or otherwise to be a party to these agreements. A contracted physician is one who sets his fees in accordance with the terms of the agreement. In this case, you only make what is known as the co-payment, i.e. the difference between the amount refunded by the health insurance fund and the fees set under the agreement. A non-contracted physician is free to set the prices he wishes. He can therefore charge in excess of the fees set under the agreement. This is referred to as additional fees. These fees are never refunded by the health insurance fund. A partly contracted physician sets his fees in accordance with the terms of the agreement on certain days and at certain hours. The hours during which the agreement fees are applied must be clearly publicised. The status of each of our health care providers is shown on their page on our website and can also be seen on the INAMI website.